Trimdon Colliery Community Association has been able to go ahead with an outdoor gym project after receiving funding of £5,000. 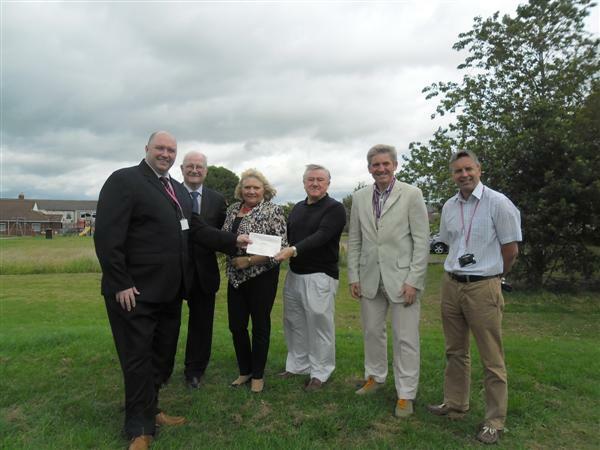 From left to right: Malcolm Gray, Community Investment Advisor for livin, DCC Cllr Morris Nicholls, DCC Cllr Lucy Hovvels, Dr Alan Bell, Treasurer of Trimdon Colliery Community Association, DCC Cllr Peter Brookes and Paul Todd, Community Coordinator for livin. Homes and communities business, livin, has donated money from its livin communities fund to allow the association to embark on the project. The project is aimed at improving residents’ health and wellbeing, enhancing community cohesion and environmental regeneration. The funding from livin will allow Trimdon Colliery Community Association to apply various improvements to the current play facilities within Trimdon Colliery, including formalising of the entrance to the recreation area, planting, and the installation of an outdoor gym. It is also expected that the introduction of 12-15 pieces of gym equipment will help to restore the area, whilst creating a safe environment for the community to meet and exercise. The Trimdon Colliery Association will work in partnership with Groundworks North East in order to begin work on the project in June 2014, which is expected to last two months. County Councillor Lucy Hovvels, said: “The Trimdon Colliery Community Association are delighted to work in partnership with the livin ,Groundwork North East and Cumbria ,Durham County Council neighbourhood members budget, Trimdon parish council and the local young school children to develop the Trimdon colliery outdoor gym .